A new year and a new men’s tights blog! In news that will be of interest to all men who buy and wear hosiery, the Tights For Men blog was recently launched. We believe that the more men are writing and reading about tights, the more that they will become more visible and acceptable. We recently interviewed the writer behind Tights For Men and are pleased to publish our conversation. It’s great to see a new men’s hosiery blog starting up. Can you tell us why you created the Tights For Men blog? Firstly let me just say thank you for taking the time to interview me and the support you’ve given my blog, it’s much appreciated. 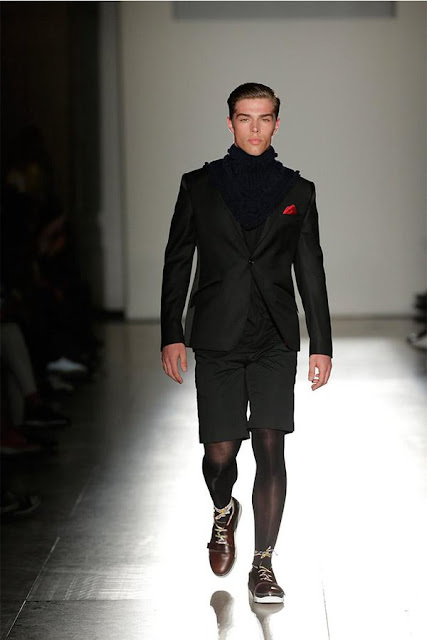 My main reason for creating the blog is to add my voice to the growing trend of men wearing tights. The more it is talked about and seen the more mainstream it becomes and the less it is viewed as a fetish or abnormal. The second reason is to try and give men some good honest feedback on what I’ve tried to help with their choice of tights. For a female shopper there is a lot of information available to them, this is not the same for men and there are so many options, it can be a bit of a minefield. My hope is if there was man thinking about trying tights for the first time, starting to look around, maybe a little overawed by the choice out there he’d come across our blogs and it would give him the information needed and, fingers crossed, help make his first experience of tights a good one. What will the blog focus on? I can see that there will be reviews of tights, but is anything else planned? For now I am mainly going to focus on reviews plus any interviews such as this one (providing I get more offers!) I will let it naturally evolve and see what people like and respond well to. Perhaps I might add a little more commentary to the blog, but Twitter is generally a better tool for that I think. If anyone reading my blog has any particular requests however I am always open to suggestions. When did you start to wear tights? I’ve worn them under trousers for a couple of years now after my wife gave me a pair of hers on a particularly cold day. It was her suggestion, she’s never understood why more men don’t do it as they are in her eyes so similar to wearing long johns. As you can imagine those hand-me-downs got a little old and so this winter I started browsing to buy myself some more, that way I could get what I wanted, they would fit better, plus I wouldn’t have to pester her anymore! I’ve also got a little braver over the last couple of months and started wearing them with shorts on warmer days. My plan now is to get some lighter denier tights in the spring as I’ll probably start to over heat in what I’ve currently got! Where do you normally buy your tights? Have you had any memorable shopping experiences? I wish I could tell you some interesting stories but all my shopping has been done online so far. There are a number of great online hosiery retailers, the likes of UKTights, Luxury-Legs, TightsTightsTights and SockShop to name a few, that between them have such a wide variety of hosiery that I haven’t needed to venture out onto the high street. What are your favourite brands? Do you have a favourite pair? For me a great pair of tights feel amazing on the inside and the outside, by that I mean they’re nice and soft on the legs but also silky or velvety to touch. Wolford really do make superb tights, as proven by their recent hosiery award, managing to be both long lasting and luxurious. For me though Aristoc’s 80 denier tights from their ‘Ultimate’ collection, that I reviewed recently, have to be right up there when considering value for money. They are soft, velvety, warm and a great fit, they are my go-to tights! Are there any brands that you are eager to try out? As you can imagine with my relative inexperience there are a number of styles and brands I‘d like to try and as with any hosiery enthusiast the luxury brands always appeal, the likes of Fogal, Falke and more of the Wolford range. However my immediate interest is to try out some of the unisex and men’s tights to see how they compare to what I’ve warn so far. For example Comfort4Men look amazing, I love the look of Emilio Cavallini’s unisex tights and the argyle tights from Adrian look great. Many men are buy tights made for women, if they are sure the sizing is right and they meet their requirements. What are your thoughts on this considering that there are an increasing range of tights made specifically for men? Good question, and a difficult one to answer. There is a growing range of tights for men which is great to see and I offer my support to any company looking to market tights to men. The choice is still rather limited at the moment in terms of number of brands and colours compared to the tights marketed for women (understandable given the size of the market). I hope the growth continues and I think it will, it has only got to be a matter of time until the trends seen on the catwalk from the likes of Givenchy, Alexander McQueen and Nuno Gama makes it’s way onto the high street. Once that happens, with a little clever advertising men’s tights could really explode. For now though as a general rule, I think you get better choice and value for money from women’s tights. For me there are three main benefits, warmth, I’ve found them so useful for that extra layer in the winter, I personally find that if my legs are warm I am warm. For those that say ‘just wear long johns’, they are far better than long johns, they are more comfortable, fit better and because of the variety in denier they can be worn in a wider temperature range. Secondly compression, there are tights designed for compression but I find even non-compression tights make your legs feel more supported and energised. Finally comfort, let’s be honest they feel amazing on, especially if you shave your legs, there’s no feeling like it. Thanks for speaking to us Tights For Men. I hope Hosiery For Men readers will check out your blog and also follow you on Twitter. We are looking forward to reading more of your reviews and whatever else you publish on the blog.